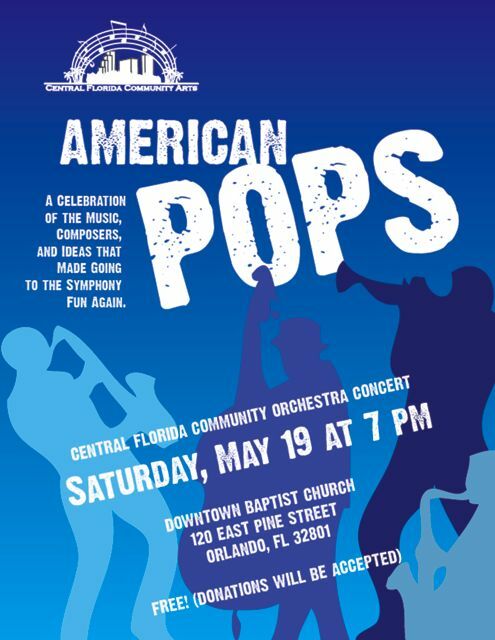 Join the Central Florida Community Orchestra as they proudly present their inaugural concert, American Pops, a celebration of the music, composers and ideas that made going to the symphony fun again! There will be something for everyone in this presentation, from Fiddler on the Roof to Eleanor Rigby to a medley of John Williams favorites. No tickets are needed, as the concert will be FREE, with donations to Central Florida Community Arts, a 501(c)(3) organization, gratefully accepted. So make sure to join us at Downtown Baptist Church, 120 East Pine Street, 32801 on Saturday, May 19 at 7:00pm!